Is Turkey—due to its size, location, economy and sophisticated Islamist ideology—set to become the West's greatest problem in the Middle East? A tumultuous decade has passed since the Justice and Development Party was first elected to office on Nov. 3, 2002. Almost unnoticed, the country exited the pro-Western era started by Mustafa Kemal Atatürk (1881-1938) and entered the anti-Western era of Recep Tayyip Erdoğan (born 1954). 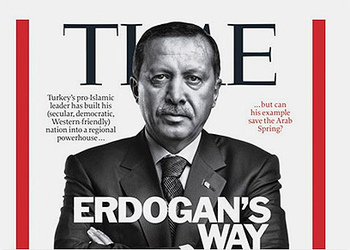 Turkish prime minister Recep Tayyip Erdoğan on the cover of Time magazine in 2011. The 2002 election followed 10 years of back-and-forth between weak center-right and center-left governments. The 1990s also witnessed the country's first Islamist prime minister, Necmettin Erbakan, in power for a year before his ousting via a "soft" military coup in 1997. In retrospect, that period marked the interim between the death in April 1993 of Turgut Özal, the towering former prime minister and president, and Mr. Erdoğan's becoming prime minister in 2003. It was a time of missed political opportunities, economic mismanagement and endemic corruption. The era was marked by the Susurluk scandal of 1996—in which the investigation of a provincial traffic accident led to revelations of government connections to the mafia and state-sponsored assassinations—and the government's inept response to a 1999 earthquake, exposing hitherto unknown depths of incompetence and callousness. Such failings prompted the electorate to turn to the freshly formed Justice and Development Party, known as the AKP, less for its Islamist policies than for its promises of European Union membership, better democracy and more freedoms. Helped by an eccentric political system requiring parties to gain 10% of the vote to enter parliament, the AKP won 34% of the vote and controlled 66% of the seats in 2002. Erdoğan speaking at an AKP meeting on the 10th anniversary of its taking power. The electorate was apparently encouraged by the results—especially the Europe-like reforms and China-like economic growth—and rewarded the AKP with 47% of the vote in 2007 and 50% in 2011. The popularity allowed Mr. Erdoğan to entrench himself, his party and his ideology ("Minarets are our bayonets, domes our helmets, mosques our barracks, and the believers our army"). Most important, Mr. Erdoğan sidelined the military establishment (Turkey's ultimate political authority since the days of Atatürk) and the rest of its deep state—the intelligence services, the judiciary, law enforcement and their criminal allies. The AKP government also reversed Atatürk's legacy of looking to the West for inspiration and leadership. The almost complete collapse of anti-Islamist forces—Atatürkist, socialist, Westernizing, military and other—is the most surprising development of the past decade. Opposition leaders did little more than say "no" to AKP initiatives, offering few positive programs and often adopting positions even worse than those of the AKP (such as promoting pro-Damascus and pro-Tehran policies). Likewise, intellectuals, journalists, artists and activists carped and complained but failed to propose an alternative, non-Islamist vision. And so the AKP enters its second decade in power with Mr. Erdoğan crowing at a party meeting about "a historic beginning" and dominating the country as no other Turkish politician has done since Atatürk. His primary challenge is to restrain himself and not overreach. Yet there are signs he is doing just that—alienating non-Sunni, non-Turkish-speaking minorities; borrowing too much; ramming Shariah law into practice too quickly; altering the constitution; and undermining the military by jailing its former leadership. Internationally, he is flirting with an unpopular war with Syria and presiding over ever-tenser relations with Iran, Iraq and Cyprus. A once flourishing alliance with Israel has evaporated. If Turkey only a year ago appeared to Newsweek and others to be the Middle East's "new superpower," Mr. Erdoğan's excessive ambition—often attributed to a dream to regain the power and prestige of the Ottoman Empire (1200-1923)—might be exposing the limits of Turkish influence. Distancing itself from NATO, surrounded by increasingly antagonistic states, buffeted by internal crises, Ankara finds itself ever more isolated and more remote from great-power status. 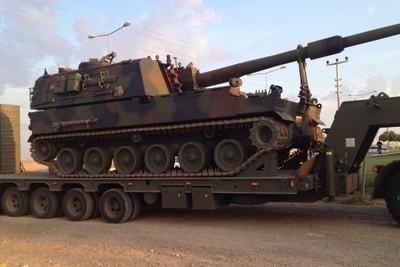 Turkish self-propelled artillery en route to the Syrian border near Akçakale. 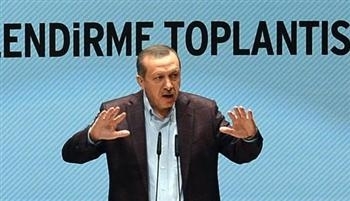 Should Erdoğan lose electoral approval, look for him to adopt nondemocratic means to stay in power. He outlined this course even before becoming prime minister, famously declaring that "Democracy is like a streetcar. When you come to your stop, you get off." His proto-dictatorial mentality can already be seen in such steps as challenging the independent judiciary, fostering nonsensical conspiracy theories to jail his opponents, imprisoning countless journalists and issuing preposterous fines against unfriendly media companies. These autocratic ways are growing over time. After a decade of reasonably democratic rule, impending crises—economic, Syrian, and with Turkey's Kurdish minority—may signal Mr. Erdoğan's moment to jump off the democracy streetcar. As the AKP bares its fangs, look for the Republic of Turkey to further reject the West and grow to resemble the repressive, stagnant and hostile regimes that characterize the Muslim Middle East. And watch to see whether Western leaders perceive the changes and act accordingly, or continue to cling to a vision of Atatürk's country that is no more.